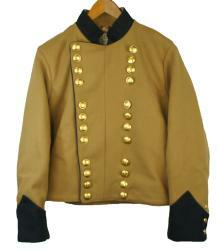 C&C Sutlery provides a full line of Shell Jackets for the Confederate Officer. We offer single & double breasted jackets, sleeve braid & collar insignia, Branch of Service piping trim or solid trim. Officer shell jackets are always lined. All of our officer shell jackets can be customized to meet your needs. In many cases, we can duplicate a shell jacket from a picture. If the options below don't meet your needs, call us to discuss your specific customization. All Officer Shell Jackets are custom made specifically for you and subject to a restocking fee. Please allow 4-6 weeks for delivery. This is a basic CS officer shell jacket. This jacket is double breasted with a 14 button front with CSA or CS staff buttons, has a function cuff with 3 buttons, is lined with a cotton lining, and has 2 inside pocket. 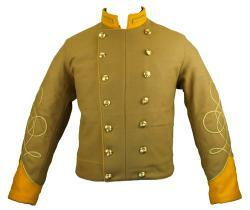 The jacket is shown with optional Collar and Cuff trim and Collar Insignia. The shell jacket is available in several wools. The C&C Sutlery CS Officer's Shell Jacket has solid Branch of Service trim on the collar and cuff. This jacket is double breasted with a 14 button front of CSA or CS staff buttons. It has a functional cuff with 3 buttons, is lined with a cotton lining, and has 2 inside pocket. The shell jacket is available in several wool colors. The C&C Sutlery CS Officer's Shell Jacket has piping trim in the Branch of Service color on the collar and cuff. This jacket is double breasted with a 14 button front of CSA or CS staff buttons. It has a functional cuff with 3 buttons, is lined with a cotton lining, and has 2 inside pocket. 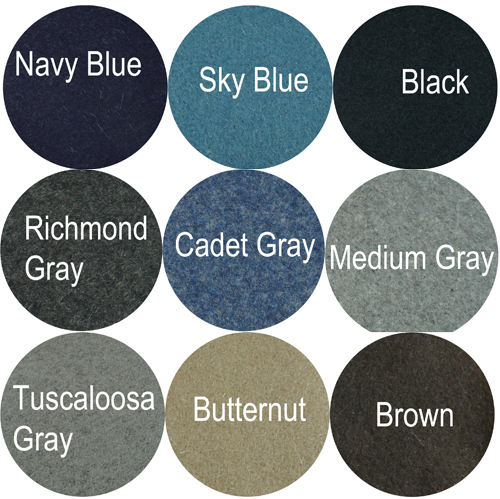 The shell jacket is available in several wool colors. 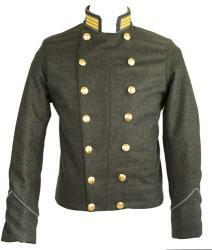 The jacket is shown with optional Collar Insignia. This is a CS Artillery officer shell jacket for a first or second lieutenant with solid branch opf service trim on the cuff and collar. 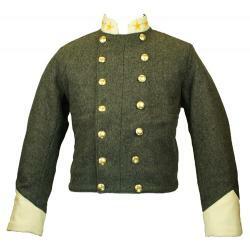 This jacket comes with a double breasted 14 button front with CSA or CS staff buttons and has a 3-button functional cuff . The shell features branch of service color solid trim on collar and cuff , lieutenant braid (one row) on each sleeve, and first or second lieutenant collar insignia. The jacket is lined with a cotton lining and has 2 inside pockets. The shell jacket is available in several wools. The jacket shown is the optional 16-button front Artillery second lieutenant shell with optional branch of service piping on the jacket front. 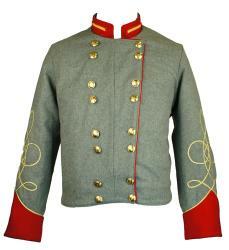 This is a CS Cavalry officer shell jacket for a first or second lieutenant with solid branch opf service trim on the cuff and collar. 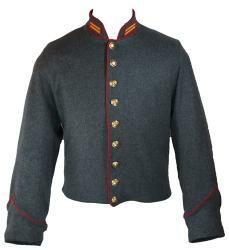 The jacket shown is a 14-button front Cavalry second lieutenant shell with optional branch of service piping down the jacket front. This is a CS officer shell jacket for a first or second lieutenant with solid branch of service trim on the collar and cuff. This C&C Sutlery Untrimmed Junior Officer CS Shell Jacket is made of officer's grade (broadcloth) wool, features a 9 button front, and a 3 button functional cuff. The jacket has a muslin lining and has one inside pocket. Homespun lining and a second inside pocket are available at additional charges. CSA, Block "A", Block "C", or Block "I" buttons are available. 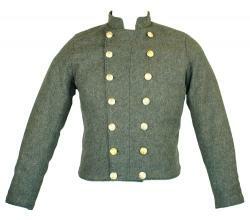 This jacket is shown in Richmond Grey, with red artillery piping trim, Block A buttons, and homespun lining. The 1st Lieutenant collar insignia is not included, but is available at an additional charge. This junior officer CS shell jacket is made of officer's grade wool, features a 9 button front, and a 3 button functional cuff. The jacket collar and inverted V on the sleeve have piping trim indicating the branch of service. The jacket has a muslin lining and has one inside pocket. Homespun lining and a second inside pocket are available at additional charges. CSA, Block "A", Block "C", or Block "I" buttons are available. 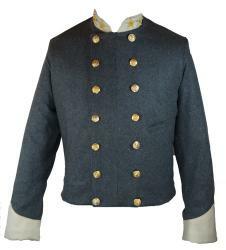 This jacket is shown in Richmond Grey, with optional red artillery piping trim on the front, Block A buttons, and homespun lining. The 1st Lieutenant collar insignia is not included, but is available at an additional charge. This junior officer CS shell jacket is made of officer's grade wool, features a 9 button front, and a 3 button functional cuff. The jacket collar and inverted V on the sleeve have solid trim indicating the branch of service. The jacket has a muslin lining and has one inside pocket. Homespun lining and a second inside pocket are available at additional charges. CSA, Block "A", Block "C", or Block "I" buttons are available.